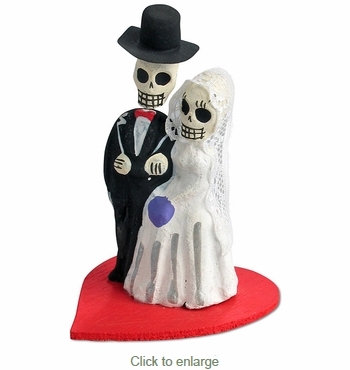 These clay bride and groom Day of the Dead skeletons are a perfect addition to your Dia de los Muertos display. These unique figurines also make a humorous wedding cake topper! All of our clay skeleton figures are handcrafted by Mexican folk artists. Celebrate this popular Mexican tradition this November with your own Day of the Dead festivities. Sold in Sets of 2. Use the quantity box for the number of sets of 2 you would like to order.